Excellent. RESPONSE: Thank you, we are happy you enjoyed your stay in Mission Gate 3B. Please come see us again sometime! Each and everyone of the staff are so nice and very helpuful! Our second stay at Casa Martin was again, excellent. Some rubber backed rugs might be nice at the side door to the patio and in the kitchen as the floor can be very slick if wet. The water pressure wasn't very good. I reported a broken cork screw:-) These are minor things ~ just thought it was something you needed to know!!! Thanks again for a fabulous week in Roatan!!!! REPLY: We are happy you had such a great time. We've addressed the can opener and the water pressure, sorry about that but thank you for letting us know. This was our 2nd time to stay at Casa Martin and we will continue to stay there when we come back to Roatan. REPLY: Thanks, we look forward to seeing you next time! Brad and Ruth and the whole bunch were awesome, the house was stay ready just like we expected, amenities were more than we expected. Couldn't have been better. House was awesome, the pool, spa, everything. Even got a new grill and boy did we break it in. Left the Kayak out overnite and forgot to put it up but the young caretaker Efrain did for us, just the most relaxing vaca in a while!! Thank you for making it possible! REPLY: Thanks, Tommy, we're glad you all had a great time. Please come see us again next year! I only have one complaint, the neighbors a few days seemed to want to play Latin Dance Music, including Latin Rap/Karoake from very early in the day until very late at night. They were not super considerate in terms of being quiet. Perhaps it was just a byproduct of Semana Santa? I mention it because the people sleeping on that side of the house would probably not return to the house ONLY for that one reason. REPLY: Thank you for your review. You are correct, that noise was probably due to the holiday week. Normally the neighbors are considered great by our guests. We did speak to them about it, and hope to have you back at Sunset House again. Everyone was very friendly and helpful. And, very responsive when we had an issue or needed something. All 6 of us loved, loved, loved the condo and it's location. Every morning on the balcony having coffee was the best. A table and chairs out there is so much better than a sofa. We ate, read and played games at that table. We've already made referrals for this property. The beds are really uncomfortable and I would suggest a layer of memory foam but we were so tired at the end of the day that we slept pretty good. The only real negative of the whole trip was the excursion with Captain Ricardo. I would never recommend this; it would reflect badly on your business. 3hrs pounding to 2 below average snorkel spots is not my idea of fun and truly wasted one whole day of our time there. Otherwise, all was excellent. Thank you very much to your whole team. REPLY: Thank you for your referrals and your review. We have passed along your suggestions about the memory foam to the owner, and we will take your review of your trip with Ricardo under heavy consideration when discussing excursions for our guests in the future. Brad, Ruth and Shanna were great. They were very helpful when we needed a guide for the island tour and the security and maid staff were wonderful. Perfect. Have already booked it for next year. REPLY: Thank you so much, we love having you all! See you next time. 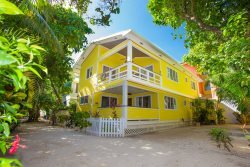 We have rented with Island House in the past and were very impressed. They were the same this time, extremely helpful and friendly. We were able to have access to the property early to bring our luggage and groceries in. Whenever I had pre-trip questions, Ruth or Shanna got back to me very quickly. I stopped at the office to purchase charcoal one afternoon and Brad informed me they were out and he would try to track some down. When we got back from the beach there were two partial bags of charcoal and a can of lighter fluid on our steps. Talk about great customer service! Ernest was also available to help if we had questions or wanted to book activities. Since we have been to the island several times in the past, we didn't utilize his services but it would be a great option for people who don't really know their way around. I would recommend Island House to anyone and we will definitely use them on our next trip to Roatan. The property itself was gorgeous and very comfortable for our family of 6. It is literally right on West Bay Beach. We enjoyed every minute of our stay. The cleaner did an impeccable job both before we checked in and mid-week. We were a little disappointed that the kitchen was not very well equipped with pots, pans utensils, measuring cups and spoons. But that was minor. Also would suggest a gas grill or at least a larger charcoal grill. Also we did experience a power outage. This was not unexpected as it is an issue on the island. However, we noticed that the unit next door had a generator. This is a premium property that nets a premium rental rate, the owners should think about back-up power. None of these issues are major and are definitely not the fault of Island House. REPLY: Thank you for your review, we are glad you enjoyed your stay! We will be updating the kitchen housewares, thank you for bringing that to our attention. We've also passed along your suggestions about a gas grill and generator. We hope to have you again! Only problem with property when the sun goes down bugs are bad. Yes I know it is on the beach. Ate my grandkids up. REPLY: Thank you for your great review, but sorry the kids were eaten up. The beach is raked daily to try and minimize the bugs, but we will look into improving this. Everyone at Island House is very easy to work with and you receive prompt replies to any questions. We had a wonderful time in Roatan. However the weather was pretty cloudy and rainy for 4 days so we didn't spend as much time in the water. Blackie and Marty cooked us a great meal of coconut shrimp and chicken. We enjoyed the new dive shop just down the beach - they were very professional. We really liked the ping pong and shuffleboard games when the weather was not so nice. REPLY: We're happy you enjoyed your stay despite the weather, and you're right-those games are great on those not-so-nice days! Thank you, we hope you can return. all members are very knowledgable, professional and eager to hear any feedback clients may have. KD's house was very clean and well stocked. It would be a deffinate asset if a small bathroom containing a toilet and sink were to be added to the upstairs bedroom, as the circular stairs can be very hard to navigate during the night. Other than that the beds, sofa's etc were very comfortable. REPLY: Thanks for the GREAT review, Cathy! We love having you back each year! The Island House team is a very professional, organized and made our family feel like an extension of their family. REPLY: Thank you, Matthew, it is a pleasure to continue to have you visit us! Amaizing REPLY: We're happy you enjoyed your stay! Your staff was very nice and answered our questions in a timely fashion. We had a wonderful stay in the Varadero. It is a spacious condo with a magnificent view. REPLY: We're glad you enjoyed Varadero! Please come back and see us again! We enjoyed hanging out at this beautiful property ,cooking, grilling, playing cards,reading.The kitchen was very equipped with everything we needed.They had fresh bottle water by each sink.House was very clean.Would definitely come back .Would recommend having your own vehicle. REPLY: Thank you for your glowing review of Casa Melody, and the suggestion for a car rental is appreciated.